Doing just inclines, declines, and flat-bench presses on chest day? SMH. Instead, multiply the number of bench angles for extreme pectoral development. As a beginner, you learned to train chest on a machine with a flat bench, and as a more advanced lifter, you now do it from a few bench angles—incline, decline, and flat bench—with various types of equipment. But is that the extent of what you need to know about bench angles to build bigger pecs? Although that approach is often touted as the most effective to build up your chest, as far as I’m concerned, it’s nothing more than a continuation of a beginner’s strategy. You want to know a better way? Read on. No matter the angle, fixed bench-press stations are typically where you complete your multi-joint presses on chest day, but there’s one big limitation that’s so obvious it seems to get universally overlooked: the fact that they’re fixed, which limits the total number of bench angles to just three. Is that actually a problem? In a word, yes! Now turn your attention to the adjustable bench. Most often, you’ll see they offer far more choices with multiple bench angles between 0 and about 45 degrees, in-between positions you’ve likely never trained before. Let’s call your attention to these and see if there are growth opportunities you’ve been missing. By now, everybody knows that you do inclines to focus on the upper pecs, declines for the lower, and flat benches for the beefy middle region. (Emphasizedoesn’t mean isolate, an important distinction. There’s always a handful of readers who say a muscle fires all or nothing, an argument I usually hear with regard to ab training. But that would make the entire concept of using multiple bench angles on chest day moot: Only one exercise would hit the entire pec musculature equally and there’d be no need for anything else. That’s obviously incorrect. What isn’t fake news: A muscle fibrefires all or nothing and thousands and thousands of those make up a muscle.) Based on the angles you’re training relative to the pull of gravity (always straight downward with free weights), you can shift the area of maximal loadinghigher or lower on your chest. The concept shifting the area of maximal loading on chest day means adding new in-between bench angles beyond what you’re already doing. Think about this analogy: If you were to drop a bomb somewhere, you’d find ground zero would be obliterated, but its severity would dissipate the further away you went. You could increase the radius of damage if you dropped another bomb 30 miles away, and another 30 miles beyond that. Now apply that reasoning to chest training: If you’re looking to maximize damage, do you drop just three bombs in the same spot over and over again, or do you start methodically spreading them all over? That, in essence, is what we’re going to do here. None of this is going to take place on fixed barbell bench-press stations because, well, duh. But with a pair of dumbbells and an adjustable bench—or you can even wheel the bench over to the Smith machine—you can multiply the number of positions you normally train with. And that’s where you’ll start mining some training gold on chest day. Consider the flat bench and 45-degree incline positions, two that you’re perhaps familiar with and use frequently. Most adjustable benches, however, have a couple of notches at in-between angles, perhaps at about 15 and 30 degrees, that you’re likely never used, and even others on the adjustable decline counterpart. As you change the bench angle, muscle-fibre recruitment is affected and moves slightly up and down your chest in response, providing subtle but significant changes to which muscle fibres on your chest are maximally loaded. A slight incline hits the pecs at that specific point of maximal stimulation better than either inclines or flat-bench presses, so why not do some heavy sets here, too? In reality, it works on the delts in a similar way; the higher the bench, the more the delts have to kick in. In that sense, limiting yourself to just a few bench angles would seem like the minimumyou should be doing. Your gains don’t have to be limited to dumbbell and Smith-machine presses; with an adjustable bench already in hand, you can take the same multi-angle approach with your dumbbell flyes, a single-joint exercise that effectively eliminates the contribution from the triceps. But don’t stop there: Variations of dumbbell presses including cable flyes (seated on a bench) and cable crossovers (standing) also allow you to not only manipulate the bench angle but also adjust the position of the pulleys, which seemingly affects the directionof gravity. Remember, cables pull from your sides, depending on where the pulleys are anchored. 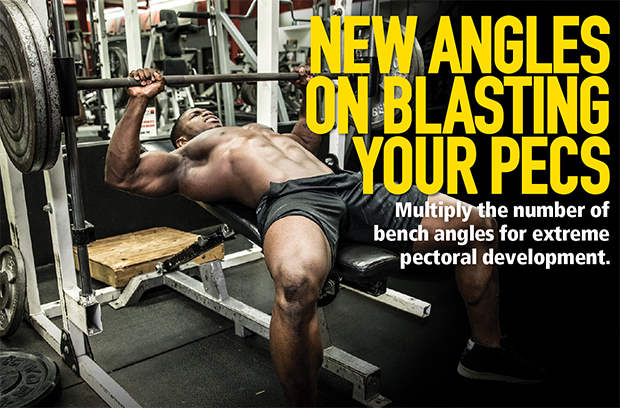 There are all kinds of ways to incorporate this multi-angle concept into your chest training. For one, you can have an upper-chest focused workout that includes three different degrees of incline for an incredible training stimulus. I’ve also given this gem to clients: Start with flat-bench dumbbell presses and increase the bench angle one notch on every set until you reach about 45 degrees, and then reverse direction until you’re flat again. (Of note, steeper angles typically require you to back off the weight just a bit because of greater delt involvement, and they’re usually relatively weaker.) That could be 7 or 8 sets in all, which counts as two exercises in your routine. Not all gyms have adjustable decline benches, but if yours does, then by all means take advantage of them. As for goosing your single-joint exercises, just follow an approach similar to what was described above. You can even follow a pre-exhaust routine that takes advantage of using in-between bench angles to pre-exhaust your pecs before completing your multi-joint movements. There are any number of ways to jump-start your chest workout when growth seems to have stalled, so keep this one in mind. Sometimes it might just be tinkering with the bench.